Roofing Contractor Insurance in Ohio. Do you own a roofing company, or are you an individual roofing contractor in Cincinnati? We can help you find commercial insurance for roofers in Ohio, Kentucky, Michigan and Indiana. Call 513-662-7000 or 800-998-0662 and speak with our insurance professionals. General Liability Insurance for Roofers in Cincinnati Is More Complicated Than You Think. If you are a seasoned roofing contractor or you are just starting your roofing company you need to make sure that you have the best roofing contractor insurance plan in place to meet your needs. Roofers insurance is much more complicated than you might imagine. We have developed a Roofers insurance coverage checklist specifically for your business that will help you choose the best contractors insurance coverage for your insurance needs. If Your Contractor Insurance Plan Is Not Set up Correctly You Could Be on the Hook for a Large Claim Payout Out Of Pocket. There are a number of different exposures that you face as a roofing contractor. If you do not purchase the correct roofing insurance coverage you could face a substantial claim that will need to be paid by yourself individually or your roofing company may need to be liquidated and you could lose your livelihood and all of your personal financial assets. 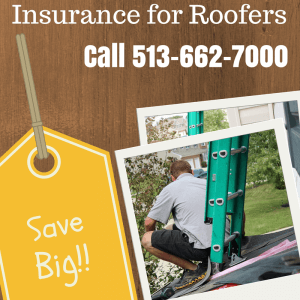 What Types of Insurance Coverage Would a Roofing Contractor in Cincinnati Need? We can help you choose the insurance you need to protect your business.